U.S. Secretary of Education Betsy DeVos testifies to Senate Labor, Health and Human Services, Education and Related Agencies Subcommittee discussing proposed budget estimates and justification for FY2020 for the Education Department in Washington. 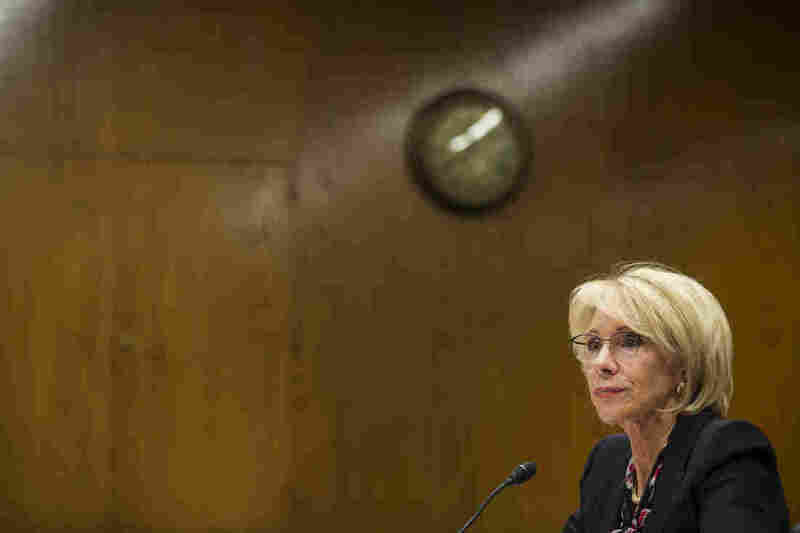 U.S. Secretary of Education Betsy DeVos will testify during Senate Labor, Health and Human Services, Education and Related Agencies Subcommittee discussing proposed budget estimates and justification for FY2020 for the Education Department in Washington. For the third year in a row, President Trump submitted a fiscal year 2020 budget to Congress that included cuts to education spending. If the last two years, and the last several decades, are any guide, Congress will decide to increase spending instead. One new wrinkle this year: The House, including the Education and Workforce Committee, is now controlled by Democrats . They asked Education Secretary Betsy DeVos to testify in favor of the 2020 budget proposal. And things got a little testy. "This budget focuses on freedom for teachers, freedom for parents, freedom for all students," Secretary DeVos stated, according to Education Week . In particular , a proposal to eliminate funding for the Special Olympics came in for censorship. By Thursday, Donald Trump reversed that recommendation, saying he would support the program after all. Teachers shot with plastic pellets are fighting back Back in January in Indiana, teachers were reportedly left with bruises after being shot with pellets during active-shooter training conducted by a local sheriff's office. Some of the victims testified at the statehouse last week. The state teacher union is lobbying for an amendment to a current school that would prevent this from happening again. The incidents are increasing questions about whether active-shooter drills, which have now become ubiquitous in schools, are effective enough in terms of safety and prevention to justify the anxiety and fear they produce in some children and school personnel. Fallout continues from the Justice Department investigation that charged wealthy parents bribed and cheated to students in schools including Stanford and Yale. The Education Department is now investigating eight of the colleges involved, to determine if any rules were violated in relation to federal student aid programs. This week, Parkland, Fla., mourned the suicides of 19-year-old Sydney Aiello, a survivor of last year's mass shooting at Marjory Stoneman Douglas High School, as well as a current student, a 16-year-old sophomore boy at the school. And across the country, Newtown, Conn., Mourned as Jeremy Richman, the father of a victim of the 2012 school shooting at Sandy Hook Elementary School, died at apparent suicide as well. suicide, contact the National Suicide Prevention Lifeline at 1-800-273-8255 (En Español: 1-888-628-9454; Deaf and Hard of Hearing: 1-800-799-4889) or the Crisis Text Line by Texting HOME to 741741. A delegation of about 150 students from elementary through high school with with lawmakers this week in Washington, including US Late. Bernie Sanders of Vermont, to plead for action on the climate. They included Azan Natar, 17, who was affected by Hurricane Harvey in Texas and 17, whose home was destroyed by Northern California wildfires. Students from Alice Deal Middle School in Washington, DC, went to the Capitol to lobby for climate change. From left to right: Haneefah Persaud, 11; Morgan Hubbard, 12; Lucy Getzinger, 12; and Ellie Schaffer, 11. 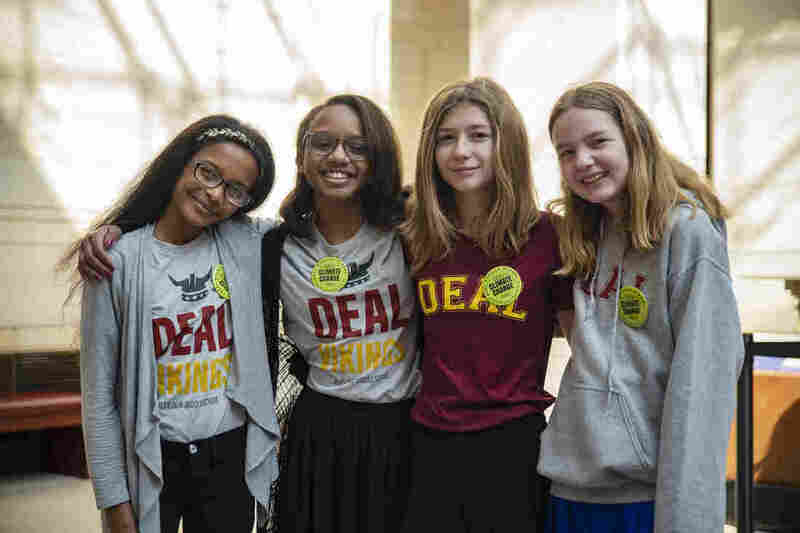 Students from Alice Deal Middle School in Washington, D.C., went to the Capitol to lobby for climate change. From left to right: Haneefah Persaud, 11; Morgan Hubbard, 12; Lucy Getzinger, 12; and Ellie Schaffer, 11. "Unlike many other political issues, there's a clear clock," said Kai Guthrie, 16, a co-founder of Schools for Climate Action, which partnered with Young Voices for the Planet to plan Thursday's meeting. He was lobbying alongside his parents, grandparents and two sisters. Guthrie says he'd like schools to teach more than the science of climate change. "We need more focus on the political side of it, and how we move Congress, and how we can count on the leaders of our nation to change. That's really the missing piece at this point."